Wow. I had a really good day. Nothing special happened. Nothing out of the ordinary. But for some reason, I’m happy and thankful for today. Work went well. Everything fell into place. The drive home was quick. Maybe its the spring-like weather? Maybe because it’s almost the weekend? As soon as I came home from work, I went straight to the kitchen to make me some happy cupcakes. Nothing makes me quite as excited as vanilla and maple baked goodies. I am very much a traditionalist when it comes to flavors. I like vanilla. Although many people may think vanilla is boring, I think vanilla is under-appreciated. Forget using imitation vanilla extract, that’s all alcohol and artificial flavoring. When you use good vanilla extract or bust out the quality vanilla beans, you get the real flavor that isn’t at all boring. 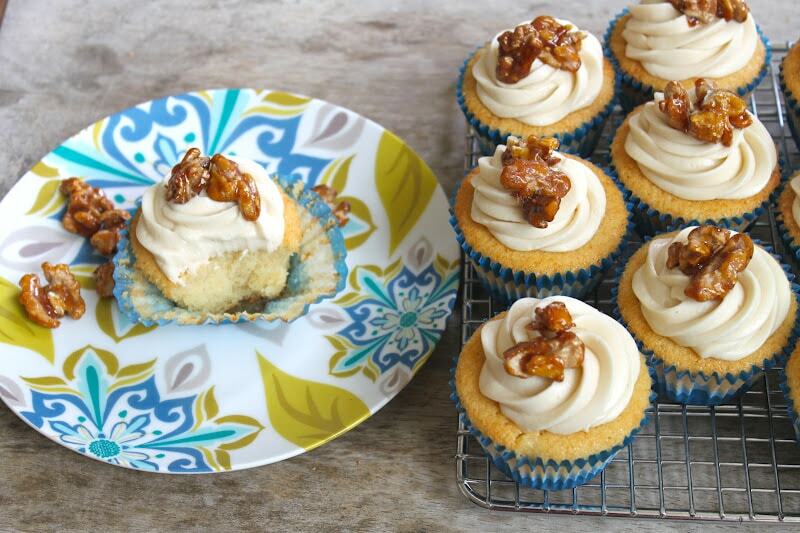 For those that still don’t like vanilla, these cupcakes are extremely versatile. Add some cinnamon to the batter and frosting to make snickerdoodle cupcakes or toss in some mini chocolate chips and a dash of mint to make mint chocolate chip cupcakes. Desserts should have different textures to keep the palate interested and wanting more. However, the dessert doesn’t need to be super complex and time consuming to make. 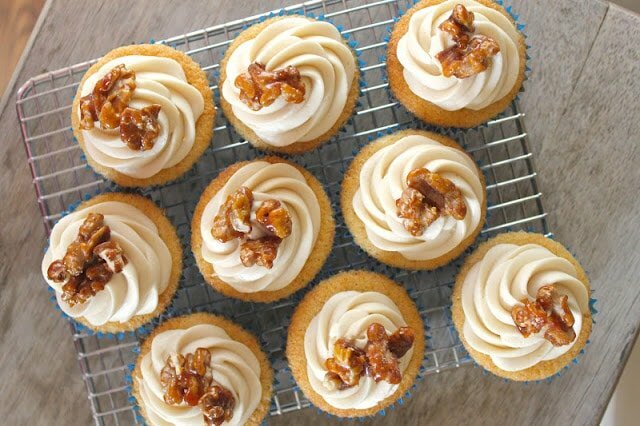 These simple vanilla cupcakes suffice. The pound cake like cupcake, the airy and sweet maple frosting and the crunchy and slightly bitter caramel that enrobes the toasted walnut all work together to create an exciting treat. Be sure to use grade B maple syrup for the frosting. Grade A and light colored maple syrup typically have a milder flavor. Since grade B is much darker in color with a stronger, more pronounced maple flavor, it is better suited for baking and flavoring. Tomorrow is Friday. 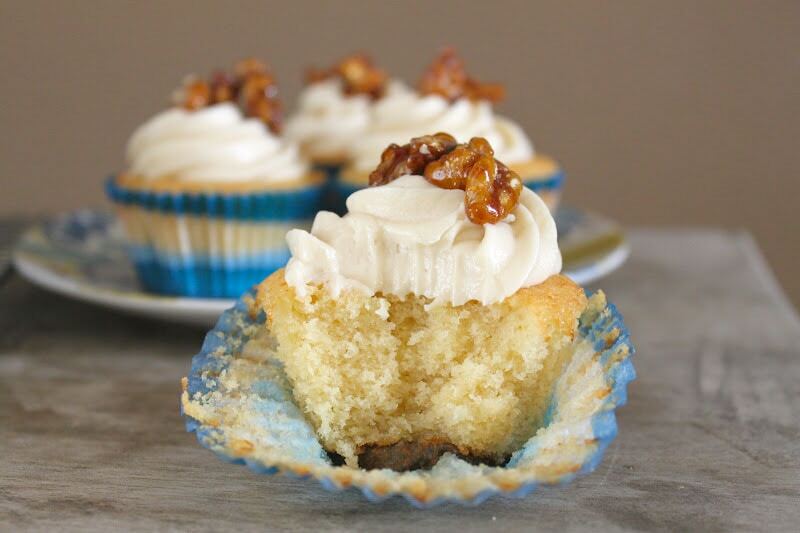 Go ahead and start the weekend early by making these delicious vanilla cupcakes. Trust me, they’ll make you pretty happy. Preheat oven to 350 degrees F. Prepare muffin tin with 12 cupcake liners. Set aside. In a small bowl, whisk together flour, baking powder, and salt. In another bowl, mix together milk, yogurt, and vanilla. Set both bowls aside. In the bowl of a stand mixer with a paddle attachment, cream together butter and sugars. Add eggs one a time, making sure first egg is incorporated before adding second egg. Scrape down bowl. Add half of dry mixture. Continue to mix and stream in half of wet mixture. Add remaining dry mixture, followed by remaining wet mixture. Mix until there are no more streaks of dry mixture. Divide batter evenly between prepared muffin tin (about 1/4-1/3 cup of batter per muffin). Bake for 18-20 minutes until toothpick inserted in center of cake comes out clean, or until cake lightly springs back when touched. Be sure to rotate pan halfway through baking. Let cupcakes cool in tin for 5 minutes before transferring to cooling racks. In the bowl of a stand mixer with a paddle attachment, cream butter and 1 cup of confectioners’ sugar until smooth. Add maple syrup and heavy cream and continue to mix. Add remaining confectioners’ sugar one cup at a time. Add maple extract. Beat until smooth and thick. Lightly toast walnuts in preheated 350 degrees F oven for 5-8 minutes. In a sauce pot, heat sugar oven medium heat until sugar dissolves. Stir with wooden spoon to ensure sugar cooks evenly. Once sugar has dissolved, continue to heat until amber in color. Remove from heat and stir in toasted walnuts. 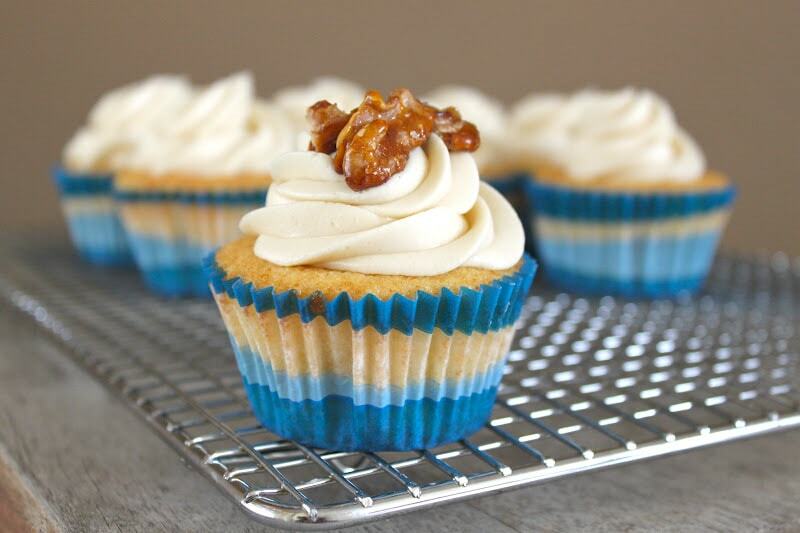 Make sure walnuts are evenly coated with sugar syrup. Pour out walnuts onto a silicon mat or greased parchment paper. Spread out nuts and separate from each other with wooden spoon or fork. Sprinkle nuts with salt or cinnamon sugar. Let cool. What a perfect Friday treat! They are beautiful! Wow, these look amazing. I love the addition of the walnut praline. Thanks for sharing. Um yes please, I want one of these! 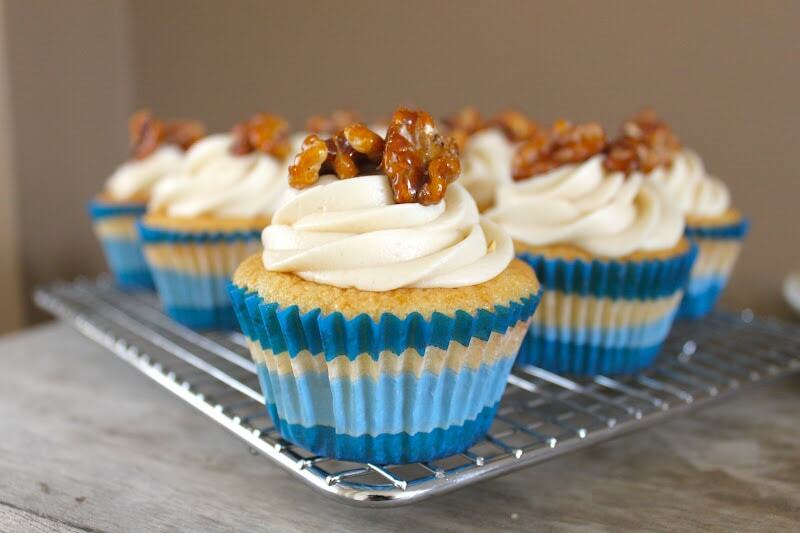 I love the candied walnuts and maple forsting – classic. 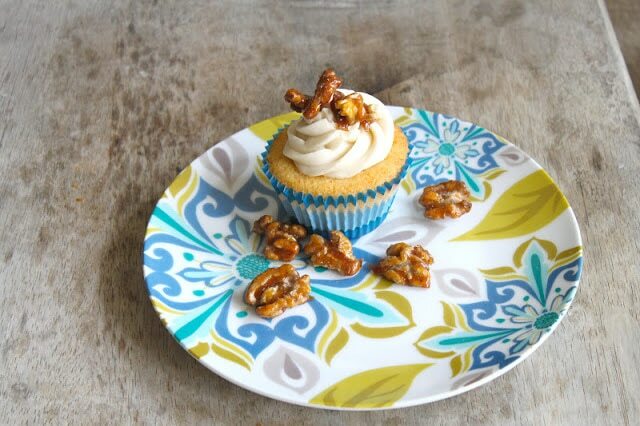 These candied walnuts take your cupcakes from wow to spectacular! Thanks! This recipe happens to be my own. If I’ve adapted it or was inspired by someone else’s recipe, I link it back to their website or to their cookbook. I love the sub sandwich! I wish I had more artistic skills. You are welcome! That sounds delicious!